Laughter on the 23rd Floor should be a nostalgia trip for those old enough to remember the early days of television. Others may see it as a joke-filled history lesson. Though the Neil Simon comedy opened on Broadway in 1993, it’s inspired by Simon’s work as a writer for Your Show of Shows, a 90-minute comedy/variety program that debuted in 1950. Hosted by Sid Caesar and performed live, it ran until 1954, when it was replaced by a similar but shorter program called Caesar’s Hour. Simon’s fictionalized account is set in 1953, when Caesar stand-in Max Prince (Donovan Johnson) is battling NBC execs over what he sees as their attempt to dumb the show down for Middle America. When the network cuts the program’s running time by 30 minutes and simultaneously slashes its budget, Prince interprets the development as a sign that he’s losing the war. Prince shares his worries with his writers, who are said to represent actual Show of Shows contributors. That explains why Simon makes the cast bigger than seems absolutely necessary. The best-known real-life counterparts are Mel Brooks, represented by Ira Stone (Joel B. Cohen); future M*A*S*H contributor Larry Gelbart, represented by Kenny Franks (Roddey Nagy); and Simon himself, represented by neophyte writer Lucas Brickman (Kyle Snyder). These obviously are/were funny people, but Simon mostly relegates their fictional alter egos to one comic attribute apiece. Stone, for example, is a hypochondriac who arrives late each day because he’s busy consulting doctors about his latest imagined ailment. Cohen plays him with panache, but Stone still seems a pale shadow of Brooks, the clown who went on to create The Producers, Blazing Saddles and Young Frankenstein. Likewise, Prince mainly is characterized by his violent excitability, which causes him to inflict a good deal of damage on Edith Wadkins’s set. Caesar reportedly was a volatile guy, but it would have been nice to see other aspects of his personality reflected in Simon’s script. Director Janetta Davis pulls distinctive portrayals out of her cast, which also includes Mark Passerrello, Aleksandar Bulajic, Jason David Collins, Keely M. Kurtas-Chapman and Katharine Pilcher. Some of the biggest guffaws are won by Bulajic, who displays spot-on timing as Val Slotsky, a Russian immigrant who struggles to deliver the F-bomb with the proper pronunciation. Others also win laughs, though more sporadically. The material is mostly to blame, though a snappier tempo might help matters in the weaker sections. One section that doesn’t need help is a read-through of a skit making fun of the 1953 film version of Julius Caesar. It reveals the kind of parody that would turn up in many later TV shows, as well as an anarchic spirit that has seldom been matched in the past 60 years of television. 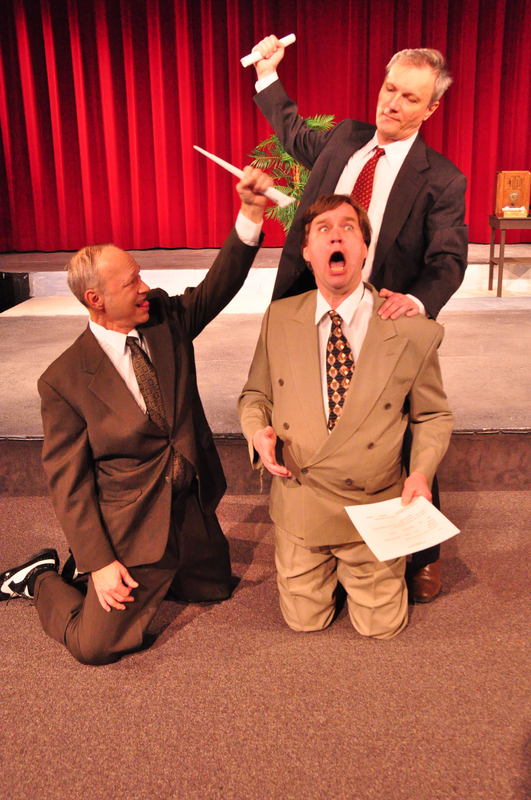 The skit, more than all the backstage intrigue that makes up the bulk of Laughter on the 23rd Floor, demonstrates why Your Show of Shows was such an important and influential part of our cultural past. SRO Theatre Company will present Laughter on the 23rd Floor through Sunday (April 21) at the Columbus Performing Arts Center, 549 Franklin Ave. Running time: 2 hours, 15 minutes (including intermission). Show times are 8 p.m. Friday-Saturday and 2 p.m. Sunday. Tickets are $20, $17 seniors (55-plus), $15 members and $10 students (grades 6-12 and college). 614-258-9495 or srotheatre.org.